HOUSTON COUNTY – The Houston County Commissioners Court met on Tuesday, March 28 to discuss a varied agenda that ran the gamut from the 100 year remembrance of World War I to the approval of using Hotel and Occupancy Tax funds for the 56th Annual Crockett Lions Club Rodeo scheduled for May 11 through May 13. One of the more lengthy discussions involved employee handbook recommendations from the county’s Human Resource Committee. Jan Pigford, who heads up the HR committee said the group had met last week and had worked on two areas of the handbook pertaining to county property and county vehicle usage. 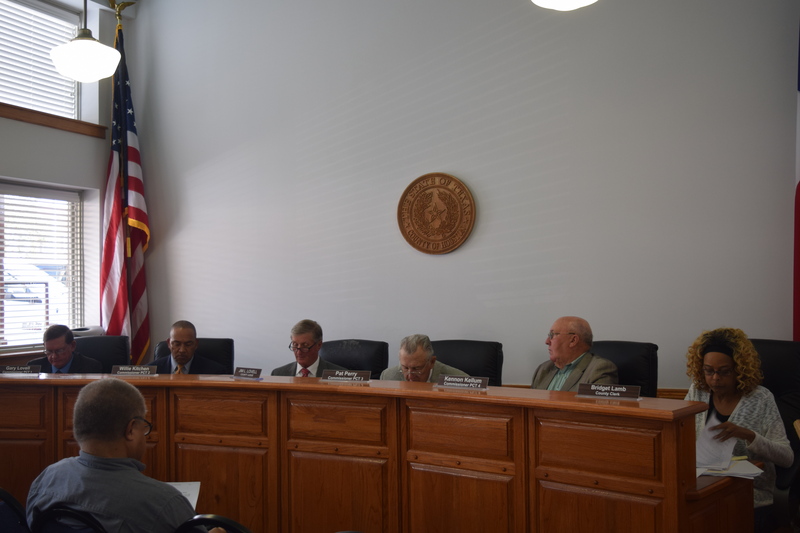 After approximately 15 minutes of deliberation, the area of county property was approved while the county vehicle policy was not approved and will be revisited at a later date. Following the HR discussion, Wanda Jordan with the Houston County Historical Commission addressed the court about commemorating the 100th year of the United States entry into WWI. “We are beginning on April 6 to celebrate the 100th year anniversary of WWI. The United States entered WWI on April 6, 1917. From Houston County, we had 563 people who went to war and 32 of them did not come home. On April 6 – at the American Legion – we are going to commemorate not only those who served but particularly those who did not return. It will be a year-long thing,” Jordan said. Prior to the meeting’s adjournment, an application was presented to the court to use $3,000 of the Hotel and Occupancy Tax funds to help promote the Lions’ Club Rodeo. The application for the HOT funding was unanimously approved. The County Treasurer’s and Compensatory reports were received as information by the commissioners. The court approved the salary for a new Houston County Sheriff’s Office (HCSO) deputy bailiff. A temporary easement was granted to the City of Crockett for installation, construction, operation, maintenance, repair and upgrade to an area near where the current DPS offices are. The court gave its approval to the county attorney’s office to apply for the Fiscal Year 2018-2019 Crime Victim Services Grant. A maintenance support agreement was approved by the court with Windstream for the Houston County phone system.